Of the fiction, several pieces are standouts: I readily devoured Stephen D. Sullivan’s “Tricks & Treats”. Exploring the origins of Halowe’en legends, it provides a creeping chill to freeze the blood. J. Robert King’s “Unlife on the Mississippi” brings humor and a clever concept to a rustic, American vampire tale. A Backwoods young man living in the Mississippi basin near Hannibal, Missouri discovers he’s suddenly become a vampire. He soon learns the how of it, and realizes the old adage that with great power comes great responsibility. Who knew it was so easy to create vampires? Jack Lehman’s “Tell-Tale Camera” puts a new spin on Poe’s old classic, the end result being an excellent palette cleanser, though it veers from the overall theme a bit. Also clever and all-too brief was David Lee Summers’ “City Project”, about vampire contractors and how the permissions needed to work on structures can backfire sometimes. Despite that I freely admit poetry is not my favorite form of expression, there was much in this collection to savor even for a cultural troglodyte like myself. Lyn C.A. Gardner’s satisfying “Salvaging The Monitor” brings to mind those souls lost at sea in battle. An ominous last line hints at something I’ve long wondered: is the search for knowledge of the past worth disturbing the dead? The eerie poem “Throat”, also by Ms. Gardner, suggests that some family bonds are better broken when death separates us. Lester Smith’s “Sudden Death” is a tasty bit of poetry about a group of recently risen dead who wander onto an ice rink in search of sustenance. A hockey team happens to be at practice, and they don’t fully appreciate this band of spectators on their ice. It’s not often the word “Zamboni” appears in any literature, but Mr. Smith works it in here to humorous effect. “Guess Who’s Coming To Dinner” by David C. Kopaska-Merkel is a deliciously subtle work that suggests a murderous wife and her lover, and her husband’s revenge. Short but very effective, it’s a chilling story with just enough use of regional dialect to hint at an Appalachian or Southern location. “Some Have A Taste” is not what one expects on first glimpsing the title, and it’s thoughtfulness is a welcome and appetizing surprise. Written by Sarah Busse, it describes spirits that are a bit out of the ordinary. Both this and “Guess Who’s Coming To Dinner” stuck me as among the more thoughtful and thought-provoking poetry pieces in this volume. Lastly, I would mention two poems by Robert Borski: “Blood Wallah” and “Rebranding.” The first will call to mind vampires with rarefied tastes – particularly to fans of more classic vampire lore. The second also brings vampires to mind, this time as a lecture from a veteran blood-sucker to a more recent, more squeamish member of their peculiar fraternity. Both are clever and entertaining, and both fit the theme perfectly. Like all anthologies, this one is no less a mixed bag, though I can’t actually say there were any bad works here – only that some were more striking and thought provoking to me than others. 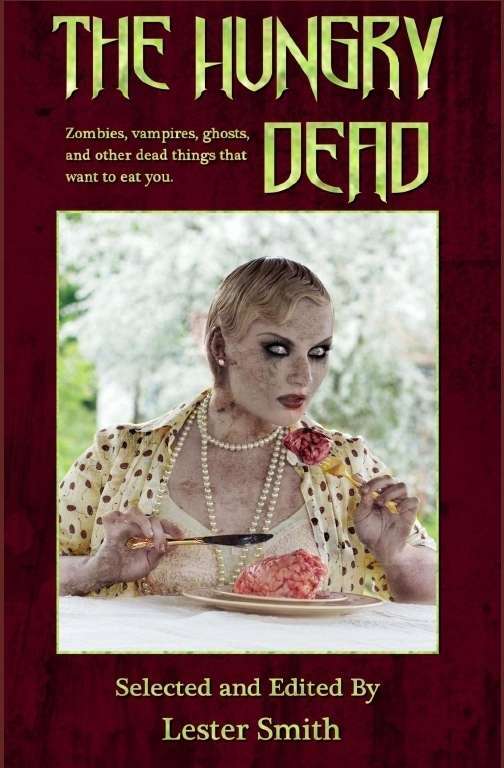 At $9.99 for a print copy from your favorite local bookstore, or as 99-cent download from DriveThruFiction.com, The Hungry Dead is cheap, and well worth picking up for horror fans of all stripes. There is very little here that will challenge the reader unduly, and a fair amount of reward to be had from its consumption.